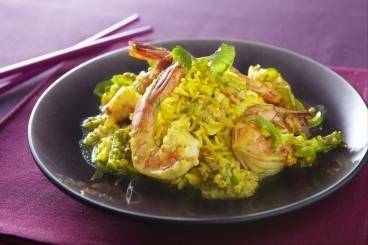 Prawns are a crustacean with a sweet and meaty flesh. They can be bought either raw or cooked, in or out of the shell. Smaller prawns are normally shelled, cooked and frozen on board the ship whislt larger varieties such as tiger prawns are usually sold raw. A fresh and earthy dish with roasted prawns, aubergines and pan fried mushrooms. 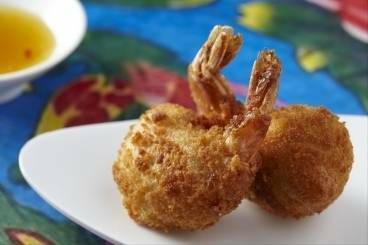 Light and crispy prawns cooked in a delicate batter with a breadcrumb finish. A Creole inspired prawn curry made with a blend of fenugreek, black mustard and fennel seeds, coconut milk and green chillies. 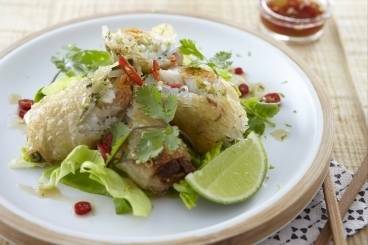 Wok fried spicy king prawns with a zesty mayonnaise and mizuna leaf salad. 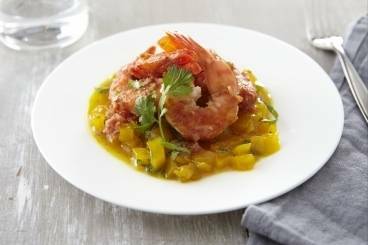 Mildly spiced prawn dish served with an authentic mango and mint chutney.